The Pentax 18-55mm F3.5-5.6 AL WR weather resistant lens features a newly designed, simplified weather-resistant construction. This zoom lens offers excellent reliability even in rain, fog and mist. 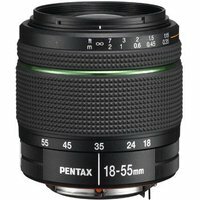 The Pentax 18-55mm F3.5-5.6 lens is a standard zoom lens which covers focal lengths from 27.5mm wide angle to 84.5mm moderate telephoto (in the 35mm format). Incorporating a high-performance aspherical ( AL) optical element and a super-low-dispersion glass optical element in its optics, it assures outstanding image resolution and remarkable brightness, even at the edges, while effectively compensating various aberrations.